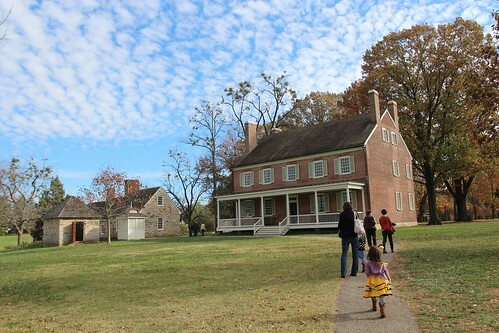 Mali Mish - Day 91: The Historic Locust Grove House. Day 91: The Historic Locust Grove House. Now that Halloween is over, the girls are going through a little bit of post trick-0r-treat depression. It might have something to do with the massive amounts of sugar they consumed last night or the fact that we will be leaving Louisville tomorrow. 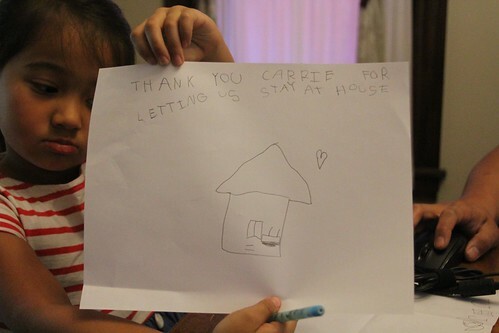 Ava decided to make Carrie a card for letting us stay with her. Even though we are leaving Louisville, we will still be hanging out with Carrie for the next few days while we do some more sightseeing in the area. We have really been taking our sweet time around this part of the country. As a matter of fact, we have not had a transit day of more than 100 miles probably since Minnesota. In these last couple of months, we have had a busier social calendar than we have ever had while living at home. We had spent only about half of our time here sightseeing and used the rest just lounging around the house. 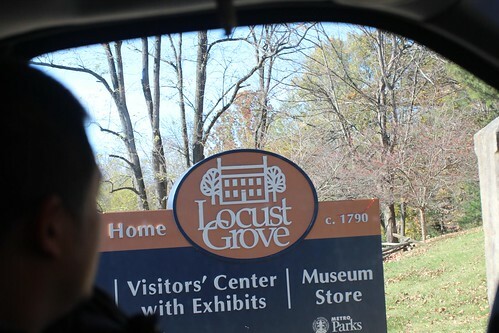 Today is going to be a productive one as we headed over to the historic Locust Grove Home and museum. 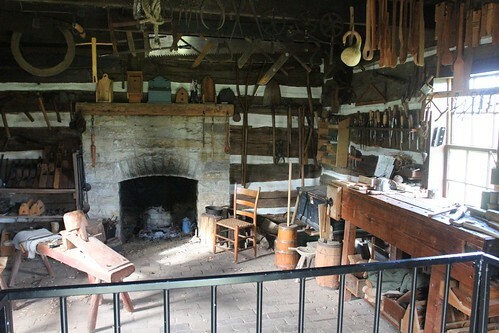 Locust Grove is a farm dating back to 1790 founded by William Croghan and Lucy Clark Croghan. Most people might not have heard of Locust Grove but for the people of Louisville, it is known as the final resting place for the man who founded the city. That man is George Rogers Clark, a Brigadier General for the Union during the Revolutionary War and Lucy Clark’s older brother. Although George Rogers Clark did not own this house, he lived here until the last moments of his life. Many people have walked through the front door of this house during that time including several American Presidents, John James Audubon, Meriwether Lewis and William Clark of the Lewis and Clark Expedition. As a matter of fact, Lewis and Clark stopped here on their way back from their journey and Lucy, the older sister of William Clark, threw them a nice welcome back party at the house. This property is also adjacent to the boyhood home of the 12th President of the United States, Zachary Taylor. He lived in that house between 1790 and 1808. Technically they were neighbors but since Locust Grove was on 700 acres and Zachary Taylor’s home was built on a 400 acre farm, there probably weren’t too many play dates that went down here. Built in 1790, this is one of the first houses in the area built using bricks instead of stones. The walls on the bottom floor are 4 bricks thick as you can tell by the depth of the front door jamb. This is our tour guide opening the door to let us in while Mila is still wearing her bumblebee antennas from last night. The home had been passed down through several generations of the Croghan family before it was sold in the late 1800s. The family who bought it kept it in their family for well over 100 years before selling it to the city of Louisville to renovate it to its original condition. The home was painstakingly renovated and nothing was spared to make it as original as possible to achieve that 1790s look. The paint colors were analyzed and historically accurate recreations of them were used during the process. 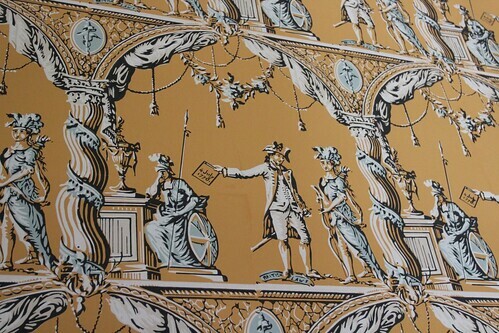 Even the wall papers that are used were hand-made to the exact specification and design that the rooms once had. 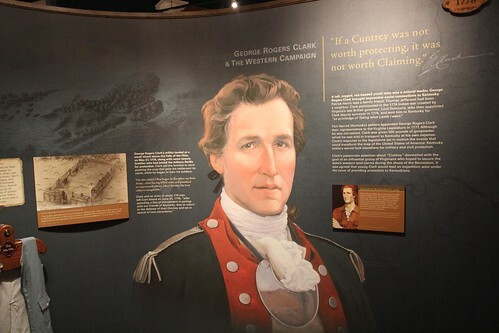 George Rogers Clark served an important role in the Revolutionary War. As the highest ranking officer in the northwestern territory, he lead and fought important battles in Illinois as well as Indiana that lead to the British ceding control of the territory. Even though he was once a celebrated soldier, he ended his military career in disgrace and was forced to resign. He claimed that he was never reimbursed for this wartime expenditures and lived the rest of his life in near poverty. 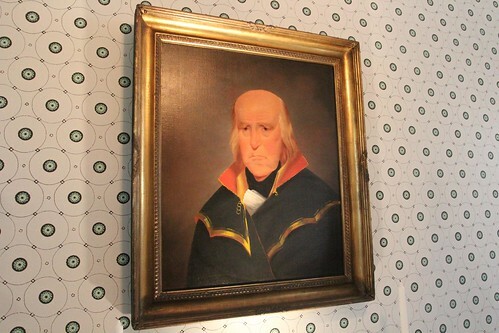 This is a painting of George Rogers Clark that hangs in the hallway in the lower level of the house. It was painted just a couple of years before he died in 1818 after suffering a stroke. This room is also in the lower level and would have been the dining room. 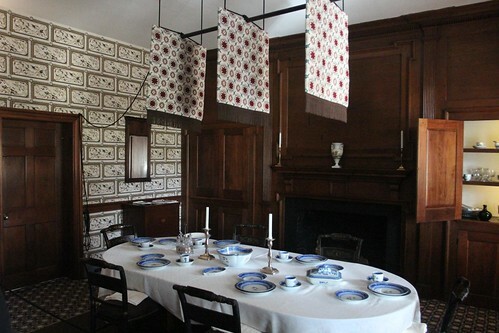 All of those visitors that came to this house would have dined in this room that is set up probably very much like this. 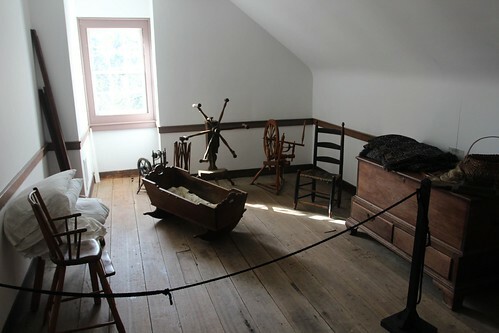 The 3 panels of fabric mounted on the ceiling would have been operated as a fan by a slave who would pull using the attached rope. Luckily now a days we can buy ceiling fans from places like crestarfan, you can check out their ceiling fan sales & promotions. 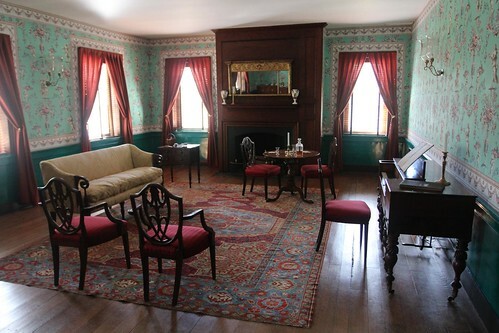 This room on the second floor might have been used by Lewis and Clark during their visit as they shared stories of their expedition with the Croghan family while sipping Kentucky Bourbon or Irish Whiskey. 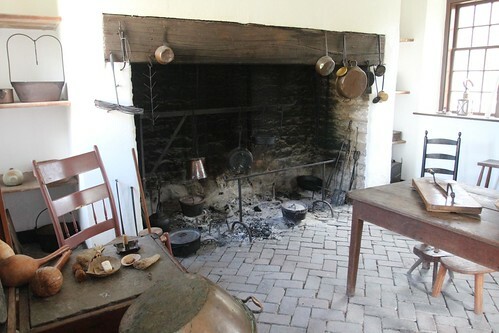 As the house is now a museum, the caretakers will often set up rooms using various artifacts to represent scenes that might have taken place in them. One of the bedrooms was setup as if John James Audubon was staying in it at the time. In fact, our guide gave us the tour as if we had traveled in time 200 years. 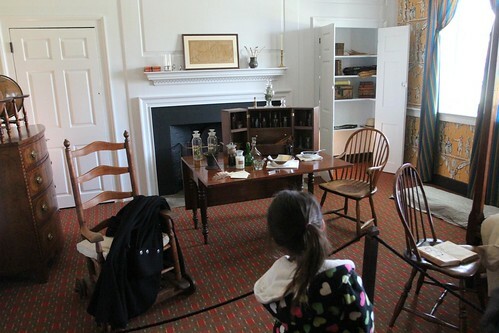 She used the present tense a lot when she would talk about why certain objects are on display in these rooms. I guess we had interrupted Mr. Audubon during one of his sketching sessions on this day. Ava was asked by our guide if she knew what this thing was. I am pretty sure Ava knew but felt a little peculiar as to why she was asking her about it. At the top level of the house were children’s rooms and unlike today, children back then didn’t get everything they want. Even their rooms were often finished to be just ‘good enough’. Besides the main house on the property, there are several smaller buildings. As it was a farm, many other people lived here along with the Croghan family. Slaves, caretakers and their families would keep the farm operating and they all needed places to stay. As we walked into the kitchen, I could smell that someone had just recently cooked pork in there. 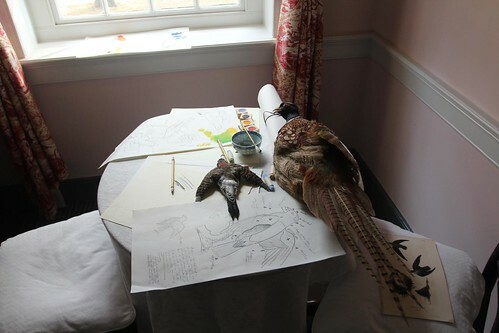 I suppose John James Audubon got hungry while doodling his birds and must have come down here to fix himself a BLT. This is the tool shed of the property. Not only does the museum collect historically accurate furnishings for the home, they also have an impressive collection of historical hand tools in here. Although I found the house and the property that it is on to be fascinating, I can’t say that the girls felt the same way. In fact, Ava got in a bit of trouble with me when she loudly exclaimed that the tour was ‘BOOORRINNNG’ right to our tour guide. Umm, OK, we are leaving now. On our way back to Carrie’s house we stopped at one of the many new restaurants that have opened up in Louisville. This one is called ‘The Garage’. 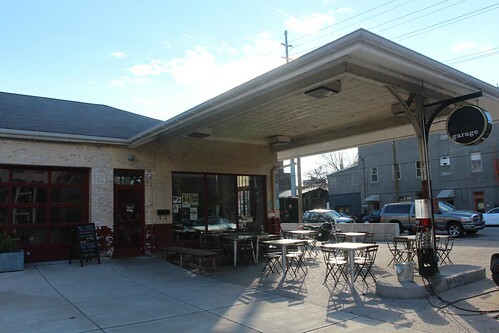 It is a pizza joint and bar that is housed in a former gas station/garage. 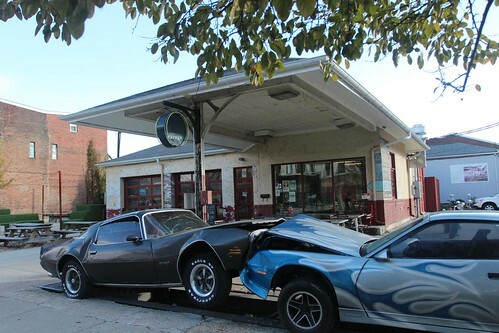 If you drive by and see these two cars in a head-on collision, do not call the cops. It is part of the restaurants decor. These two cars are mounted on a track powered by hydraulics to be in a slow motion crash. There is no noticeable movement of the crash as you stand next to it, but over time, these cars are doomed with total annihilation. 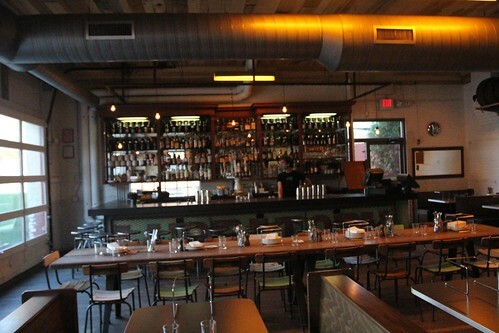 You wouldn’t know it but right inside those garage doors is a very hip and trendy restaurant with a full bar. This place would feel right at home in Los Feliz. Our pizzas were tasty and Carrie’s gnocchi was delicious. 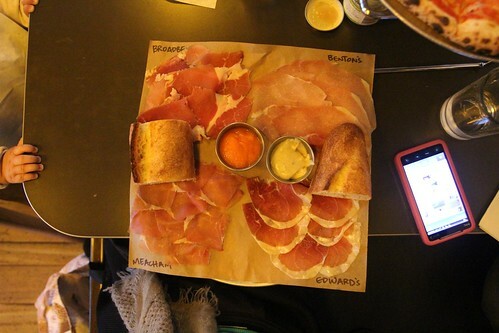 Marlene opted for the dairy-free country ham sampler which she had no regrets nor leftovers. 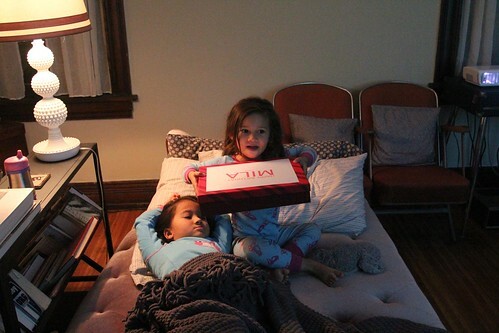 When we got back to Carrie’s house for our last night’s stay, Mila got a belated birthday present from Carrie. Ava, don’t look too excited for your sister. Day 92: Leaving Louisville for another stay in Lexington.